This salad was actually the product of a clean-out-the-fridge dinner before heading out of town last week. It turned out to be quite a masterpiece if I do say so myself and I can’t wait to make it again. 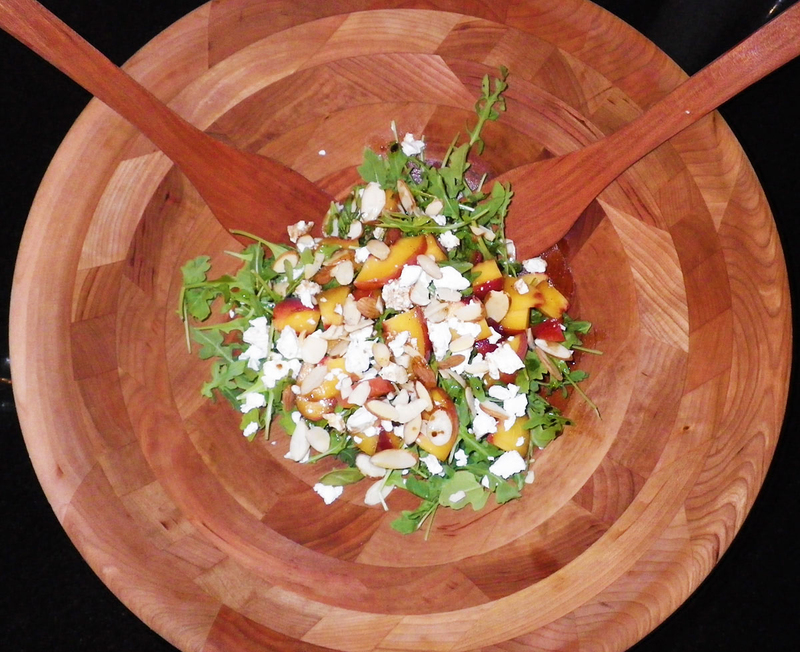 I love the combination of peppery arugula, sweet peaches, punchy goat cheese and crisp almonds. Add some grilled chicken for a more-exciting-than-your-every-day lunch. Start by making the dressing. Combine 1 part balsamic and 2 parts olive oil. Grind in a little salt and pepper, whisk together and set aside while you build the salad. For the salad, top a bed of arugula with sliced peaches, crumbled goat cheese and sliced almonds. Give the dressing another whisk before drizzling it over the salad, then toss, plate and serve.